A Rotherham-based manufacturer which is enjoying significant growth thanks to its use of innovative technology is set to further expand its workforce. PMS Diecasting plans to increase staff numbers, from the current 53, during the first half of 2014 to meet expectations that the business will grow by 50 per cent during the next three years. The company recently moved to larger factory premises designed to meet the growing demand for its products after receiving £600,000 in funding support from Yorkshire Bank. The deal was conducted by Chris Blanksby from Yorkshire Bank’s Business and Private Banking Centre in Sheffield. PMS Diecasting supplies the UK’s agricultural, automotive, hardware and retail industries with high-quality, bespoke metal fixtures, fittings and components. These include wire suspension systems for lighting rigs in shops and cold touch components for inclusion in the driver consoles of luxury cars. 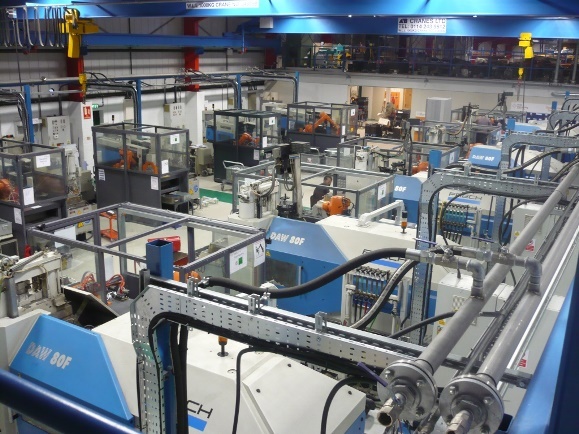 The new factory is regarded within the industry as one of Europe’s best equipped facilities, boasting 12 fully automated diecasting machines, each with six-axis robots which enables the company to manufacture its products cost effectively. The company’s introduction of cutting-edge laser scanning technology has generated a significant surge in new business. The innovative technology allows almost any item to be scanned and reverse engineered. PMS Diecasting’s customers for this technology include museums which are scanning their exhibits in order to produce replicas. The technology allows accurate scale models of any item to be made and the CAD (computer-aided design) files it produces can then be used in conjunction with 3D printers to generate perfect scale models of any size. Gordon Panter, managing director of PMS Diecasting, took over the business in 2000 and has overseen a period of sustained growth for the employee owned company. “Our attention to detail and dedication to delivering what customers want, when they need it, has played a key role in growing our business to what it is today. “Our reputation coupled with the use of leading technology has put us in a position to take our business to the next level and with the support of Yorkshire Bank we are taking that opportunity. “PMS Diecasting is a strong, local manufacturing business which South Yorkshire can be proud of. “It already plays an important role in the supply chain of a number of key industries but still has ambitions to grow further.